The West Midlands TaxPayers’ Alliance officially opened for business after a launch event outside the uncompleted 'The Public' art gallery in West Bromwich on Tuesday morning. The day went to plan, with our eye-catching 55ft poster truck stealing the show and providing a great backdrop for the protest. The press gathered to take photographs of the demonstration, 'The Public' and the truck before we headed into town to distribute our launch leaflets and collect signatures for our petition that calls for a halt to spending anymore on this outrageous venture. The launch was covered on the front page of the Evening Mail, with large articles in the Express & Star (the UK's largest circulation regional newspaper), the Coventry Telegraph and the Birmingham Post (along with the picture on the left). There was also follow-on coverage in yesterday and today's Express & Star. We have to build on this successful launch now to grow our membership, which in turn will give us even more exposure and legitimacy in the region. The Petition is now available to download on our website to print off and circulate and you can also sign the petition via the Downing Street Website. We hope to present the petition to Sandwell Council in November, if not before as a way of keeping this issue on the local media agenda. Monitor project management – assessment of all London Organising Committee of the Olympic Games (LOCOG) and Olympic Delivery Authority (ODA) project management developments. Our campaigning and research agenda for the 2012 Watchdog will focus on budget costs, to hold politicians and officials accountable for any further cost over-runs. We’ll also be commissioning a study of the true costs of 2012 and what the final budget is likely to be. Next week, we’ll be releasing research we have conducted assessing the cost-inflation linked to the Olympics, particularly in the London and South East construction industry and property market. We’re also going to be making transparency an issue – advocating greater openness over contracts and commissions and to demand regular updates from the Government and its agencies on the progress of the project. And, as ever, we’ll be keeping a keen eye on any examples of Olympic waste. We have had such a flurry of new activists in the last month or so that we have almost completely run out of campaign material. That said, we are on the case to order new stock and after numerous requests, we have also produced new TPA window stickers to help us all show support for the low-tax cause. We have 4 different designs, each one perfect for displaying in a car window or porch (or giving to a sympathetic taxi driver to put in their cab). To request a pack of 4 window stickers, please send a self-addressed envelope and a donation of £1 (or more if you like) to our London office (address is here). We are also close to ordering new "Wish You Were Here" supporter postcards - by far our most popular design. These new ones will have the added benefit of a freepost return service, so no stamps will be needed. By October, we will also be producing a new national TPA leaflet which will serve as our main piece of printed material for supporters, and will include an integrated envelope and reply slip - once again, all freepost to maximise returns. To coincide with the launch announcement of the 2012 Watchdog, we produced a new research note drawing together the main figures so far on the cost of the 2012 Games, including some parallels with the Athens Olympics of 2004 at the same stage that raise concerns that the final bill for 2012 could yet rise still further. As we all know, London 2012 is already almost four times over budget. Taxpayers are hoping that the final cost will not exceed the revised budget of £9.35 billion. There are, however, a number of worrying indications that the final Olympics bill could rise to as high as £12.6 billion, especially since most of the Athens overruns occurred in the four years preceding the Games when construction got underway. To read the research note click here (PDF). The TaxPayers’ Alliance investigated the Government’s purchasing of hybrid cars. We found that the government could have bought equivalent, non-hybrid, cars for the Government Car and Despatch Service’s fleet and saved the taxpayer £888,000. With massive growth in emissions in countries like China and India there is a strong argument that the £888,000 has simply been wasted. However, if the Government really wants to spend that money cutting emissions it could have got far better results by planting trees. 74,028 trees could be planted, in the UK, for that money. 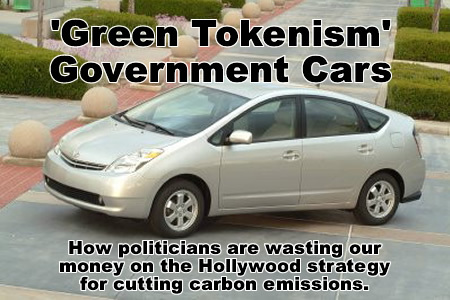 Instead, politicians chose the trendy Hollywood option and bought expensive, hi-tech new cars. Read the note here (PDF). (Other examples of green tokenism will be exposed in the months ahead). Economics 101: Is Harry Potter creating a generation of low-tax activists? Better Government: Public service reform ‘to stall’ under Brown – what public service reform? Please feel free to send suggestions of anything you'd like to see integrated into the new website in future (website@taxpayersalliance.com). In addition, if you write your own blog on related TPA issues, why not apply to join our "Low Tax Coalition" of bloggers, and help each other attract sympathetic readers? (email matthew.sinclair@taxpayersalliance.com).